Over the past 30 years economic strategy has separated into two broad camps, largely driven by the underlying culture which made the choice. The Anglosphere countries such as New Zealand, the US, Australia, Canada and the UK have followed a deep belief in the primacy of markets, an intent if not the reality of ever smaller governments, lower taxes and an expressed policy emphasis on their domestic non-traded sectors, seeing their tradable sectors as at best a policy afterthought, and at worst structurally unnecessary. It should be no surprise that down this path tradable sectors shrink bereft of policy support and consequently investment. 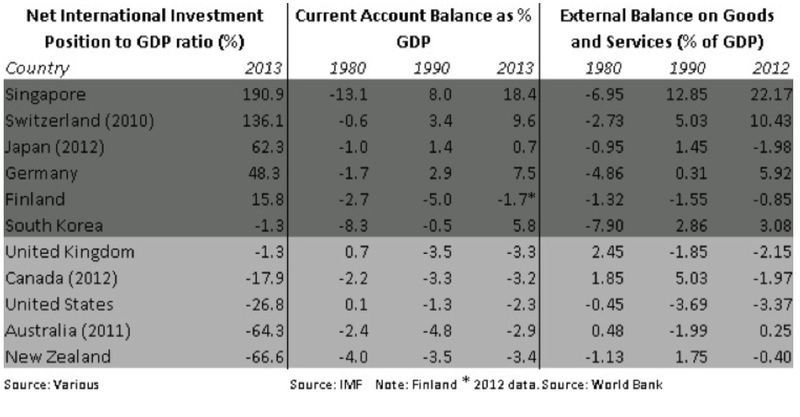 By contrast, back then some still developing economies such as Singapore, Korea and Taiwan, and some developed economies; Scandinavia, Israel, Germany, Switzerland, and Japan followed a different path, choosing instead to see expansion in their value added traded sectors as critically important to the long term structural development of their economies. This way of thinking leads to making complicated things that people want, building jobs, skills and capabilities that go on to develop and strengthen and reward those skills and capabilities to keep on making and selling ever more complicated and desirable things to the world. To underpin this culture there is a need to keep their manufacturing and tradable sectors strong, adding jobs and ever more value making their economies both more complex and diverse. How this happens in detail differs from country to country, but what they have in common is the belief, backed by policy, that a strong value added tradable sector based on competitive advantage is vital for economic success. To be clear comparative advantage matters – such as the ability to produce dairy products at a lower marginal cost than others, but competitive advantage builds added value from imagination, skills and capability. Broadly making things includes ideas and creativity operating in the productive domain. Stuff must be imagined before it is made, and made before it is consumed; the broad domain of production provides us the material and artistic things we value. Neoclassical economics denies the difference between potato chips and microchips – they might be the same in the short term but in the long run the complexity of what we produce fundamentally defines our relative position in the world economy and determines our long term standard of living. An economy is a complex adaptive system. We may not be able to perceive the details at work but over time an economy will both mirror and drive the policy and regulatory environment. Think of this as a seesaw: the economy sits on the plank and the policy framework bears down on the plank. At one end of the seesaw is policy that favours value added activity and biases towards complexity; at the other end policy that favours the domestic economy, pushing towards simplicity – the economy responds to the policy bias. As a bias develops, those agents in the economy that are winning press for yet more supportive policies and the bias is entrenched. 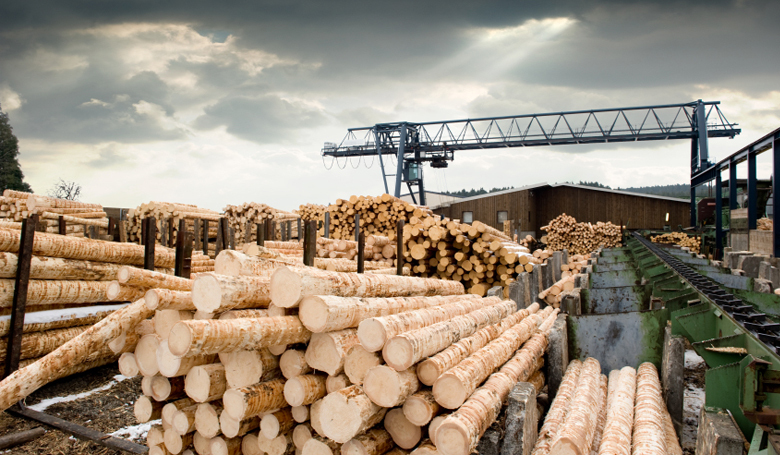 How we weight the plank determines how the economy responds, and having responded the economy influences the policy framework. It is vitally important we get this right; there is no point in expecting more investment in research and development and innovation if our economy is biased toward simplicity; in general who would make the investment? This is a long term emergent behaviour responding to the overall bias in the system and over time they will reinforce the prevailing system bias. So if the choice is between simplicity at one end and complexity at the other, does it matter? A resource based economy producing logs and milk powder derives value from comparative advantage but gets little return from available creativity and competitive capability that might exist, and furthermore, does little to support and build any nascent competitive capabilities. This sort of economy has little need for highly skilled, innovative people: it is a race to a low wage economy. The Economic Complexity Index (ECI) assesses economic complexity: the higher the value, the more complex the country is in terms of economic activity. As examples, activities which contribute the most to economic complexity are Machinery (2.54 ECI), Chemicals and Health (2.52 ECI) and Electronics (2.25 ECI), whereas the industries that have the lowest values are Cotton, Rice, Soy and Others (-2.3 ECI) and Oil (-2.1 ECI). On the ECI scale (2012), New Zealand is ranked 52nd with an ECI of 0.47. When we compare New Zealand value with countries who are biased toward added value, we score much lower: Japan (2.4 ECI), Germany (1.9 ECI) and Switzerland (2.0 ECI). This is important because complex enterprises have positive flow on effects to the economy which goes on to build further network effects. This means having access to all the business activities and services required to provide all the products and services needed to support differentiated supply chains, manufacturing activities and production processes. The US sits at 1.6 ECI, due to their large technology sector; military, pharmaceuticals, space, auto and aviation, while Australia is much lower at -0.2 ECI, due to their reliance on the mining sector. 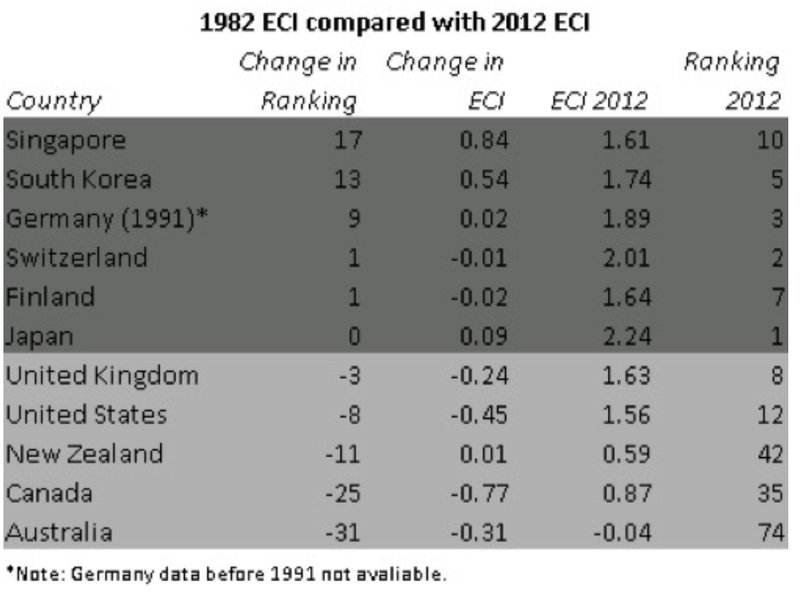 The table shows ECI values from 1982 and how ECI ranking then compares to the ECI ranking in 2012. Two groups emerge: those in the top group who promote a complex tradable sector either held their ECI rankings or improved dramatically. In contrast, the Anglosphere sample all saw a slide down the ECI rankings, demonstrating a loss of complexity in their economies. The large economies have further to fall and are getting simpler more slowly, whereas the smaller economies that have less complexity to start with are racing for the bottom. Those economies that choose the complexity path are holding their own or improving, at least in comparative terms. No real surprises in the above table; net international position and current account balances are better, over time, when the policy framework supports the productive sector, and this is generally the case for our complex economies. The correlation to ECI index is clear, consequently in terms of economic performance, complexity leads to better outcomes on many important measures. 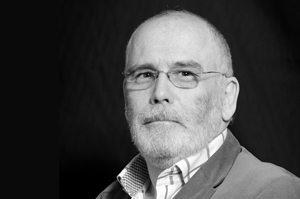 Promoting complexity should be the starting point for policy makers; it is easy to do nothing and stand back claiming market forces will find the best way. That approach defaults towards simplicity, and simplicity results in falling comparative economic performance. There is no single action or magic bullet that will change this bias, and the existing tendency will not change quickly. Any effective changes will trigger resistance from those currently benefiting from the status quo. So the challenge for policy makers and officials is explaining the necessity of a number of interrelated policy changes whilst dealing with the resistance from those negatively impacted by the policy realignment. So what must change? Perhaps the most vital and immediate area of reform is our monetary policy. It is evident that the single minded focus on short term interest rates to cool inflation allows the Reserve Bank to deflate the tradable sector via the exchange rate mechanism. 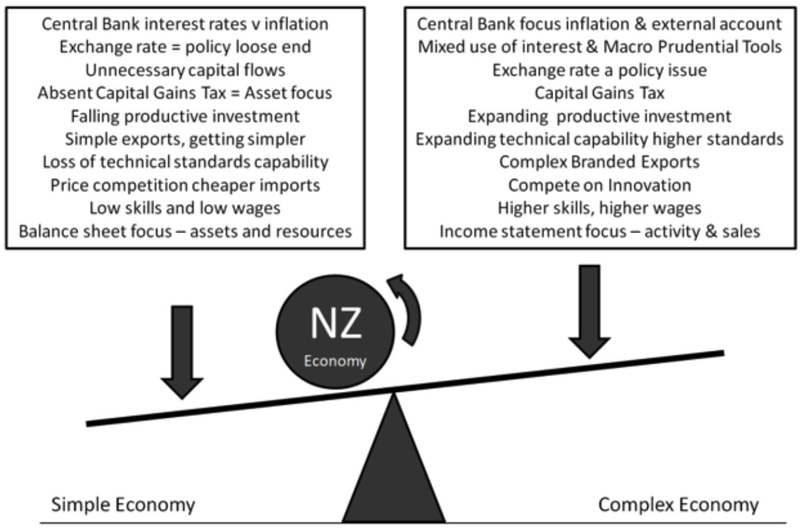 Without a countervailing requirement to ensure a balanced external account, investment in added value exports will always be a higher risk and hard to justify considering the small size of the New Zealand domestic market and potential price competition from imports boosted by an overvalued New Zealand dollar. Looking at economies outside the Anglosphere one can see many positive incentives for investment in complex activity: supportive monetary policy, a broad based tax load (including a capital gains tax) research and development tax incentives, accelerated depreciation, export tax incentives, training incentives. These choices speak to the strategic decision to support and build economic complexity with the intention to trade in complex products and services. We can do the same in New Zealand if we so choose.